A high-performance telephoto lens with the widest aperture in its class. Whether you're shooting a distant mountain peak or a beautiful orchid at arm's length, this superb telephoto lens provides amazing image quality. 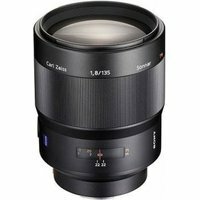 Its f/1.8 aperture makes it the brightest telephoto lens in its class -- and with 35mm-equivalent 202.5mm focal length plus the ability to focus tightly on objects closer than three feet away, it can cover an amazing range of photographic assignments.